The Singapore International Film Festival (SGIFF) is the longest-running film festival in Singapore and was started in 1987. On the occasion of its 25th edition in 2014, Ben Slater put together a collection of articles and interviews with the people who made the festival possible. 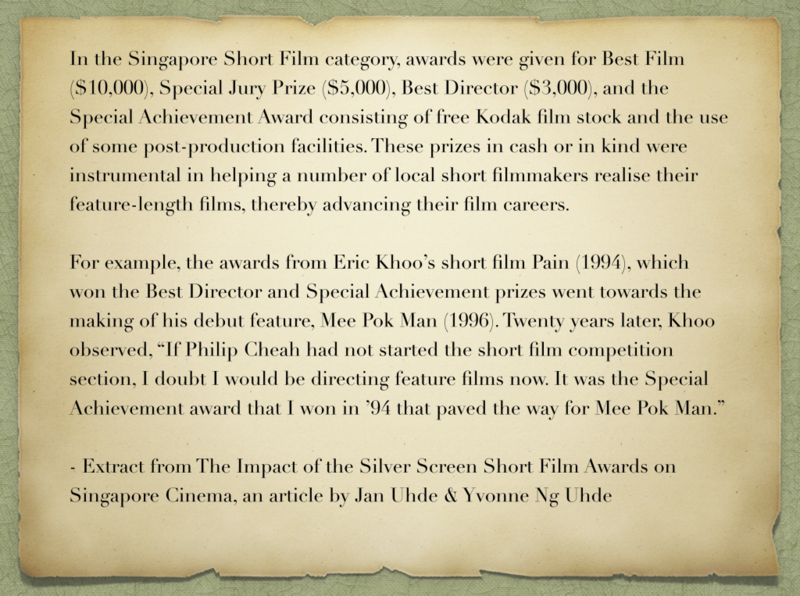 He titled it 25 Histories and Memories of the Singapore International Film Festival. 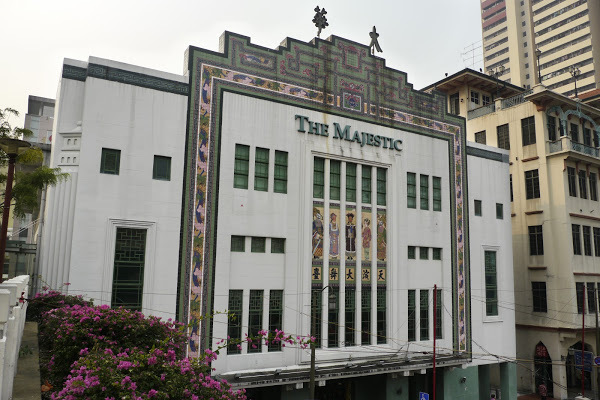 The book outlines the history of a festival that was created and sustained by a group of cinephiles, which paved the way for the revival of film production in Singapore. It also expanded the horizons of cinema over two and a half decades for local audiences. This book is special, for it painstakingly gathers anecdotes from people who worked on every aspect of the film festival like ticketing, film print traffic, publicity, hospitality and film programming. They paint a vivid picture of the insane amount of work that’s done to ensure the audiences get to watch films from different corners of the world. These anecdotes also depict the love and passion for cinema that were crucial for this film festival to survive for more than a quarter of a century. When you finish reading the book, you’ll realise that the festival is a collage made up of eclectic pictures glued together by the magic of cinema. Ben Slater is a writer and editor. 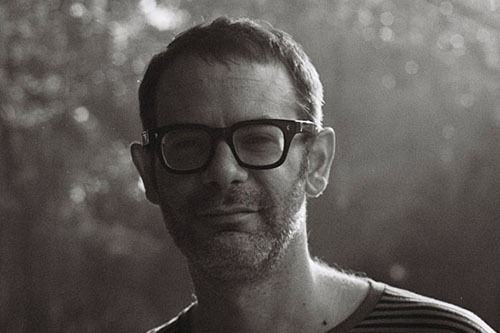 He’s the author of Kinda Hot: The Making of Saint Jack in Singapore and co-screenwriter of the feature film Camera (2014). He is a Senior Lecturer at the School of Art, Media & Design in the Nanyang Technological University. The first film he saw at the SGIFF was We Sold our Souls for Rock ‘n’ Roll (2001) at Great World City in 2001. In addition to editing this book, Ben has also written a preface that covers the history of the Festival in depth, which is a must-read. The World of Apu interviewed Ben over email to learn more about how the book came to be and his take on film festivals. Here’s his interview interspersed with excerpts from the book that’ll help you feel the spirit of SGIFF! While working on this book, did you have any books on film festivals as a reference or precedent? 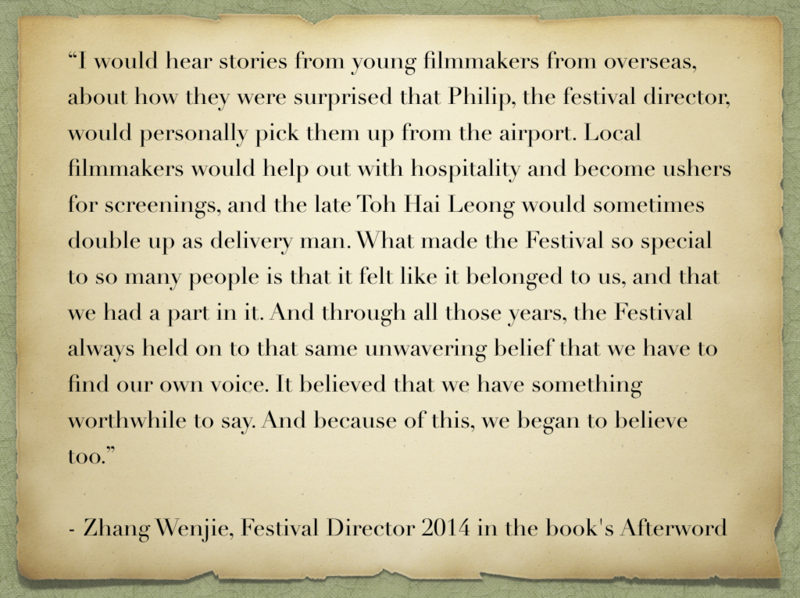 Throughout the essays and interviews, the emphasis is on the personal stories of the people behind the festival. Did you do it intentionally? How and why did you come up with this approach? The project came about because I was invited by the festival directors, which at that time was Wahyuni Hadi and Zhang Wenjie, to edit a publication that would mark 25 editions of the festival. The original intention was to create a brochure or short booklet. I pitched them the idea of a book, which would be a collection of essays by critics and personal stories from festival participants, hence the notion of Stories and Histories, although when you read it you can see there is some blurring between those categories, and I’m happy with that. Even the critical or historical voices had personal relationships with the festival, including myself. There were some people at the festival who wanted me to include the memories of local filmmakers and other public figures who’ve attended the festival, but that approach tended to be rather sentimental. I preferred to hear from those who were ‘behind-the-scenes’ and had very rarely been spoken to before. So much of the public focus on the festival is on the directors and the founders, it felt important to hear from the print managers and the hospitality people, as well as other programmers. Alternative stories and viewpoints emerged. You also get a sense of different phases of the festival, from its emergence as a kind of expat event to it discovering an identity, then becoming very influential in Asia, and then the subsequent decline. Although I couldn’t tell every story relayed to me, one thing I wanted to express was that the festival was created by disparate people banding together, and there had always been a tension and sometimes conflicts about its direction and future. That continues today. 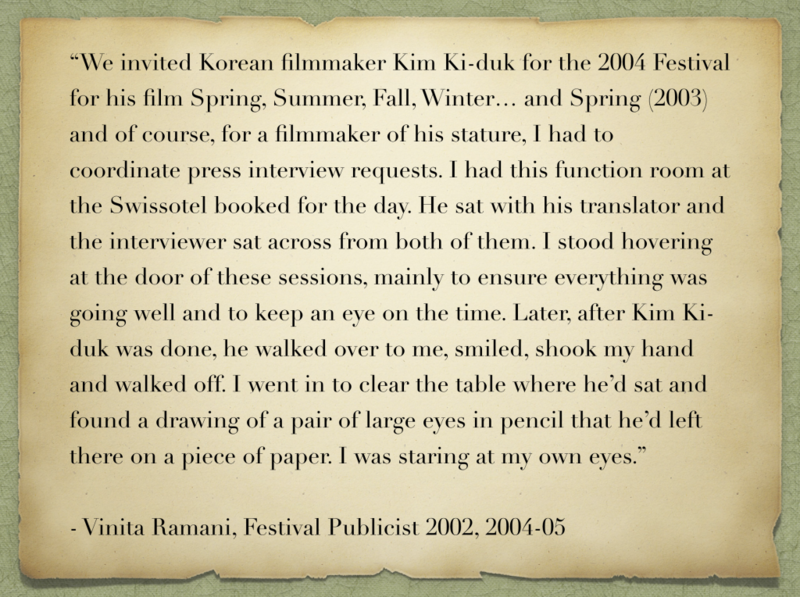 You mention in the foreword that you were guest curator of films at SGIFF in 2003. Could you tell us more about your experience? 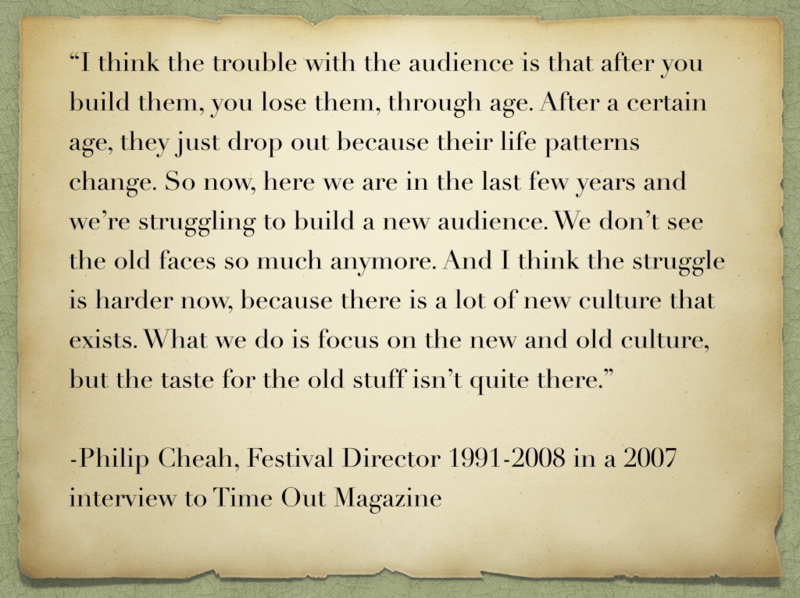 I had become friends with Philip Cheah, the former festival director, when I moved to Singapore in the early 2000s. One day in 2002 we were eating laksa in Katong and I was telling him about “found footage” films that we’d screened at The Cube Cinema in Bristol UK, where I used to work. Philip asked me to put a programme together for the following edition of the festival and I did. We screened Bill Morrison’s Decasia (a very experimental and beautiful film) in a nearly-full Prince 2. Quite a few people walked out, but two people came up to me and told me how much they loved it. I ended up working with them on some projects afterwards. 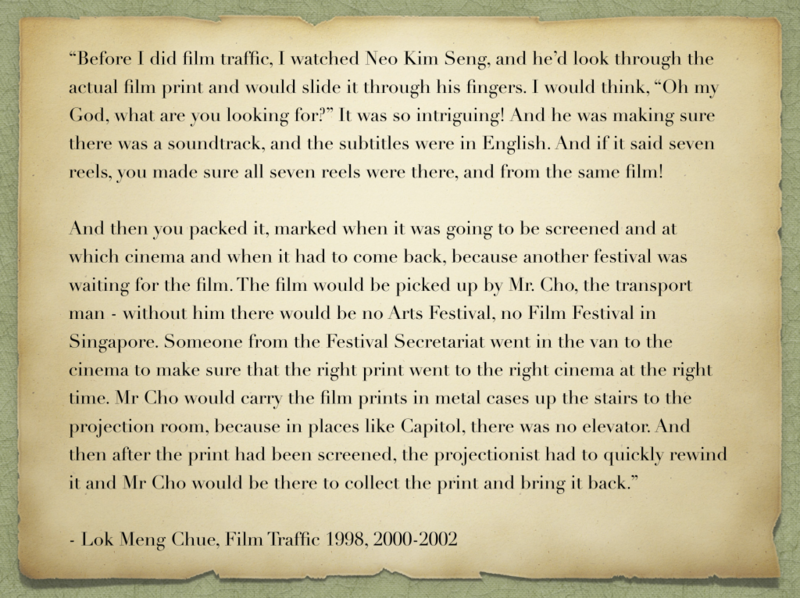 If you had to recollect any one memorable incident related to SGIFF which one would it be? It could be as a viewer or as a curator or as an editor of this book. 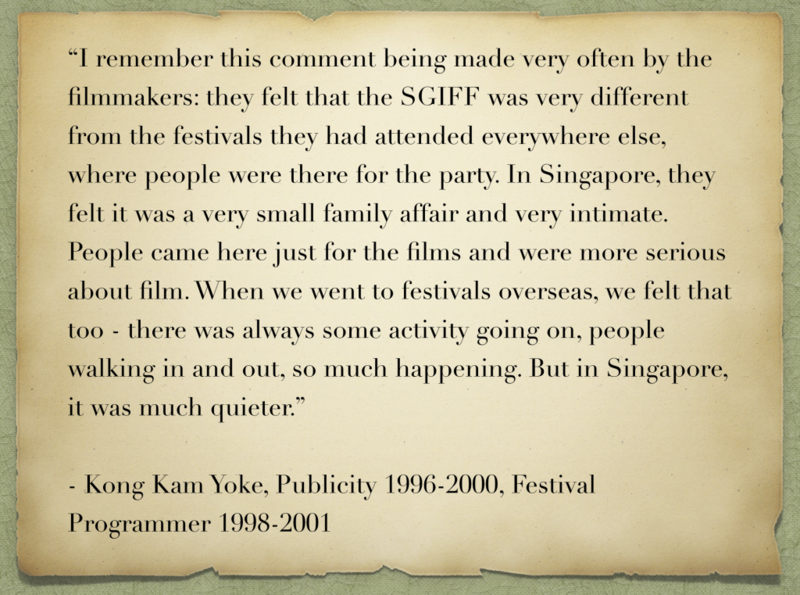 There were many memorable events during the “old” SGIFF, partly because it was run in quite an open, transparent manner. Guests would come and hang out, and weren’t being hustled around by ‘minders’ the way they are at most big events these days. One of my favourite images is seeing legendary British film critic Derek Malcolm sitting opposite Singapore’s most eccentric film fanatic, the late Toh Hai Leong, in armchairs outside the festival office in the Swissotel at Raffles City. They had nothing to say to each other, but it was amazing that these two worlds were colliding. “A festival doesn’t become obsolete because of access and technology,” say Nazir and Nisar Keshvani in their interviews. Lesley Ho says in his interview that in order for a film festival to attract larger audiences it has to strike a balance between screening arthouse and more commercially viable films. 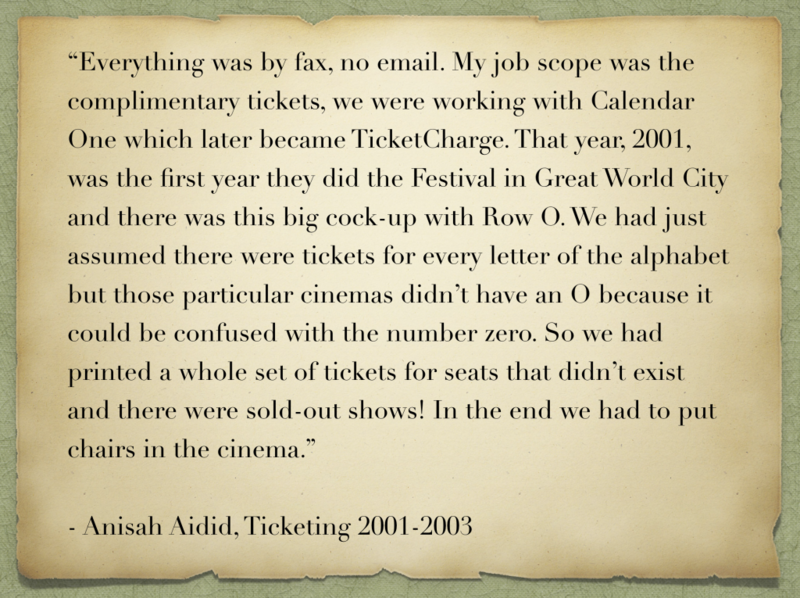 You mention in the foreword that all festivals faced an existential crisis in the digital era. What do you think is the relevance of film festivals in today’s internet era? That crisis is something all festivals have to reckon with, but ironically, in an era of much greater access to films via streaming services and piracy, there are still many, many films we don’t have access to on a regular basis. Good, expertly curated festivals can still show us things we can’t see anywhere else, but there has to be interest in that, so marketing and communication must play its part. This situation may change, but festivals are still important. The big ones like Cannes, Venice, Toronto, etc., will always be powerful, because they get to shape the world’s first experiences of certain films. Mid-mid level festivals, such as Singapore at the moment, have to look hard at what they do. If they sell out the ten films that will be distributed anyway or will be on Netflix six months later, while a lot of the rest of their programme is struggling to get an audience, then they have a problem. Currently there is an explosion of film festivals all over the world to the extent that you have portals like FilmFreeway that act as a one-stop solution for a filmmaker to reach out to multiple festivals with a single click. What do you think about this? I wouldn’t say there’s an explosion currently. The proliferation of film festivals has been happening for at least 20 years. Governments (local and national) realised that film festivals were a relatively cheap way of staging a cultural event that generates an audience, and was relatively accessible to the public. That meant every town or city felt a need to have a film festival, in a very loosely defined sense. This means almost all films can find a place to be screened somewhere in the world, and online submission portals are leveraging off that. Your book was published in 2014. Do you think SGIFF has changed since? Has it garnered more support from the government? The book came out at a moment when the festival was “rebooting” under a familiar but still relatively new team. That team had a big transition again this year when they lost the main programmer Zhang Wenjie. He is a true cinephile with a great ability to communicate with filmmakers and audiences, and he’ll be sorely missed. One of the approaches since 2014 has been to work more closely with IMDA (Info-communications Media Development Authority of Singapore). The festival shifted their dates so they can be part of the overall Media Festival which happens in November. 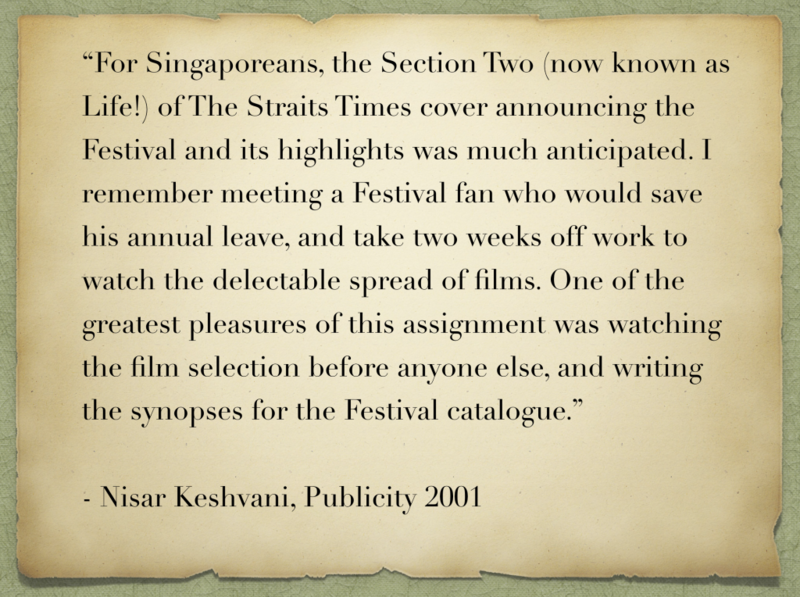 The “old” SGIFF had a slightly antagonistic relationship with the government agencies which was a part of its counter-cultural identity. That’s gone now. Ho Tzu Nyen mentions in his write-up that SGIFF is an experimental film festival. Do you think so as well? Why or why not? I agree with him… or I wouldn’t have published it! 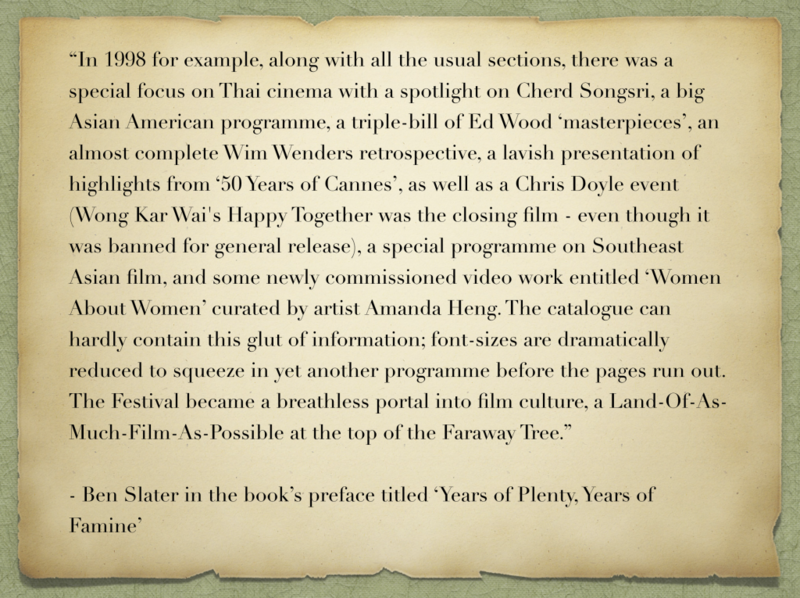 In the book, Toh Hun Ping has written a wonderful piece on the screening spaces of SGIFF and their histories. Do you have any personal favourite screening spaces? I loved Prince 1 in the old Shaw cinema on Beach Road. It was the biggest screen in town, over 1000 seats, and seeing films there was always an incredible experience. Which is your favourite international film festival? What do you like about it? My favourite film festival was Rotterdam (International Film Festival) in 2001 or 2002, which is when I last went there. It had a fantastic festival centre where you could eat and drink and in ten minutes you’d be in a conversation with a programmer from the festival, the winner of the Tiger Award and maybe even the Brothers Quay! Meanwhile, you’d go to the venues and at nine in the morning there’d be a long queue of regular people trying to get into a low-budget indie from another country. You’d go back to your hotel at night and turn on the TV and there was coverage of the festival on the national channels. It also had an amazing programme filled with discoveries from across the globe, that really defined film culture for years after each edition. That was over 15 years ago, I hope it’s still good! What would be your advice or suggestions to someone looking to organize a film festival? Find a niche. Create something no one else is doing. Make it into a genuine experience. 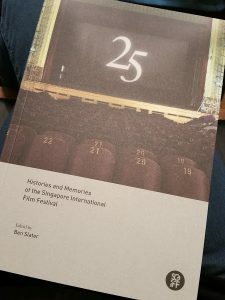 To grab a copy of 25: Histories and Memories of the Singapore International Film Festival, get in touch with the SGIFF team through their website and they can facilitate a sale. If you reside in Singapore, you may find a copy of the book in the public libraries.